They keep up with the latest technology and are excited about it. First Security Services displays what many other companies have forgotten, true customer service. I would recommend them to anyone. They response pretty quickly every time when you require. The people in monitoring center also help you schedule some appointments if you required. They are pretty reliable! Thank you. A couple of years ago during the summer when I had to be away from home 3 weekends in a row, I was broken into each weekend. However, due to First Security Services each time they notified and their response was timely enough to thwart the criminals attempted thievery. We have been having so many issues with the transients in the area and have been very frustrated. They have been so helpful and patient with me and provided me exactly what I need. They are top notch!! I can't say enough and highly recommend them. First Security Services is a nice and friendly place to work with a good management team. Highly recommend them and use them again for sure. I was in urgent need of security service. I called First Security Service. The security guards took only 2 and a half hours to reach my place. I was amazed. Thanks First Security Service. On Saturday we planned to throw an event on Monday. Called First Security Service on Sunday to get security guards. They provided us with guards within no time. My company has been hired First Security Service guards for almost a year now, and I must say guards are professional, friendly, and has answered and handled every concern that we have had. The Guard is awesome. The First Security Service is very fortunate to have the Officer representing them and we are very fortunate to have him assigned here in our apartment. First Security Service guards did an amazing job. I want to personally thank you, as an Event Manager, it gives me great pleasure to work with you and support each vendor with as much repeat business as possible. Reliable guards can't beat it! Very professional company I highly recommend their services if you are looking for a good quality security company. Our dignitaries and distinguished guests were all in good hands with First Security Service's great team. I will use them in future. If anyone is looking for a good guard company this it. Call them and you will be happy and safe you did!! Thanks First Security for the comfort and peace of mind of my safety!! I used them every night for outside security of overflow of goods for fall shipping. The rates are very competitive. And I would highly recommend First Security and definitely use them again next year during my peak season. First Security Service came highly recommended by a friend of mine. I don't think I can stop talking about how great their service is! I always seem to call them at the last minute when I need them and without hesitation they take care of the needs of myself and my clients. Brilliant job done by your guards at	Avaya Stadium. I highly appreciate their work. The service was good, but the risk of what can happen next was the down point of the job. Their staff was great. They were always in contact with their customers, and they were not afraid to work in any situation. Thanks guys for all your hard work and effort on sorting out our site in main Los Angeles great guards keep it up. ALWAYS on time always dressed good and smart never leave there badge home and prompt!! I will continue to use First Security Service for the rest of my days in contracting. I use First Security Service all the time to guard my factory on the nights. They are always on time never late, and always have correct equipment and polite. This experience was worth it, working with great people. They work hard to keep their customers happy. Overall good staff and very good management. I enjoy working with others as a team and accomplishing the goal of getting the job done in the most efficient, productive way possible. Helping someone in their job or life is very satisfying to me. Good well established company! A very relaxed environment to work with. Most people there are willing to help you out when you need the help. Thank you! I am currently working with First Security Services. They are true professionals and keeping a good look out of any and all possible dangers. Thank you! As far as the overall service, it's good. We have encountered the best service. They are honest, helpful, on time and just overall great guys. We had a First Security Service in our new house. They explained all of our options and help us decide the perfect system for our home. They are professional and helpful. We couldn't be any happier with our choice and I would strongly recommend First Security Services to any who ask. After my home was broken into, I was recommended to First Security Services by a neighbor who used them for their security needs. Starting with my very first call to First Security Services they were responsive, sympathetic and professional. I have had my security system now for 2 years and I have never had an issue with them. Great service, employees take care of issues quickly and service calls are set up soon if not the day I call. I don’t have any issues with them. Thank you so much for your service. Have had this First Security Service for three years now. No problems, an efficient system with good communication. I would recommend them to anyone. First Security Services have been right there for me after every move. In addition to being a wonderful company offering excellent services, their prices are extremely reasonable over the years. Thanks a lot. Especially during holiday break and with the 2nd floor water leak, we really appreciate you covering for us! It’s no small thing to us, the time you give and the security you provide. Just wanted to say thank you and bless each and every one of you! 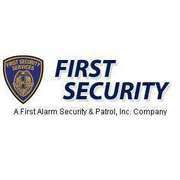 I would highly recommend First Security Services for anyone who is in need of high quality security guards for an event, or even full time for the front desk. Thumbs up. There are loads of great Security companies in the California but First Security Service one of the best I have had, Great job..
First Security Service was the firm who took my request to solve the problem which I was facing from a quite long time. Their service was too good and made me and my family tention free from the threat of the local goons. Thanks guys! The First Security Service has maintained the security standards for the Walgreens stores. Any company can benefit from having a First Security Service as part of their shrink tool.FSS is a professional organization that listens to its clients. I am happy to report once again, there were NO negative comments from our renters about our guard staff in my areas of control. This is a great accomplishment; please pass on to the troops, thank you. This is one less area to worry about with literally tens of thousands of touch-points with our customers. I am writing this review to inform you that your security staff that you have on-site at our facility… is professional, courteous and responsive to our needs. Thank you and your staff for their exemplary work. Please continue. Thank you once again. Everything was great. Your guys did an excellent job. It was very cold on Saturday night, so they must have been real troopers! No complaints. The service I received from FSS was exceptional! Provided me with x4 guards within the hour & great rates!!! As a company we have been using First Security Service for the past 4 years on different projects across the country. Always done a superb job on and off site, always dressed correctly and always have the right tools for the job if you require security I would give FSS a call. Just wanted to drop you a note to tell you how wonderful your company is and the guards that you employ are absolutely some of the finest in professionalism, courteous, well dressed, not to mention what a fine job they do. I wanted to drop you a quick note to tell you how impressed I was with you and your team. Every member of your team I met was professional, courteous and thorough – one of the best security teams I have come across in my time. Keep up the great work!! Very prompt and well organized management. Really impressed that I called out of the First Security Service at 7pm and you guys had someone here at 8:30am next day. Everything was handled professionally, on short notice, and without a lot of prep time. Many thanks! We really enjoy with First Security Service. Their staff is always on time, reliable and professional and the Management are always helpful. We have never had any problems when working with them, and when plans change as they often do, Factory Direct Floor are always very accommodating. Really good work, friendly staff who we worked with for several weeks. Would recommend strongly to anyone needing a good reliable team. First Security Service is a very professional corporation that has provided quality security services to all its clienteles. Over the past year, I have been especially impressed with how prompt and responsive the management staff has been to any inquiry or incident. First Security Service have consistently demonstrated a professional approach and maintain an excellent reputation, I would highly recommend First Security Service to any organization seeking security services. Reasonably priced services and the security guards are very professional. Totally went over and above my expectations. I won't use any other security service again. Thanks! Highly recommend this company. First Security Service is impeccable, incredible, and exceptional! First Security Service is irreplaceable in my book now. They’ve been too good by me to go with anyone else. I’ve had personal guards and residential guards. It’s all the same; perfect. Go with First Security Service. They won’t disappoint. First Security Service is the best! My corporate event went smooth and easy!! Thanks! First Security Service is professional, consummate, and high quality. I hired 5 security guards to keep my private event in check and everything went according to plan. The guards are intimidating and ready to pounce, which is what I need. I don’t need nice security guards. I need mean, ready ones. That’s what First Security Service provides. I’d like to thank those five security guards for coming out and doing their job professionally. That is the type of stuff that makes me want to buy their service again. First Security Service has AMAZING security guards. I don’t have words to describe their service, was more than I expected. Guards were professional, quick and very helpful. I highly recommend them. I'd give them full points! First time customer, but now a forever customer. Thank you! I think this was the firm I was looking for!! Now a days people are shifting to security systems, but I decided to go with a security guard for my home. As we know that only a security guard can handle an issue practically. I do not have trust on security systems so I hired a security guard from FSS and they proved that they are best in their service. When we decided to get a home security guard we met with my friend and also a competitor from one of the big companies. After meeting with both of them my wife and I agreed that we would go with First Security Service as they were suggested by my friend. Thank God that I chose these guys!!! My wife and the women in our locality had problem as in our surroundings there was a thug unit who were troubling my wife and other ladies while they pass by, we decided to hire a patrolling service firm so my friend recommended us to First Security Service, WOW patrolling from these guys made a lot of difference. We are all very thankful to First Security Service!! So far we have had an excellent experience with First Security Service. The security guard we had was professional and seemed like he knew what he was doing. All in all, we are happy to have chosen FSS. We needed a security guard for our new home. I found First Security Service and was confident about their service by seeing their good online presence. Their security guard is fantastic!!! Will use their wonderful service again for our apartment that we are planning. We live in a house that is away from the city, so we were desperately in need of a security guard who can protect us from any threat that we were facing from local thugs. We hired a security guard from First Security Service, He is doing good from 3 months and till now we have not faced any problem, but previously 3 days without a problem was to be a big deal....Thanks guys!! !